Objective: Choose and use nozzles properly and safely. Review the information below on choosing and cleaning nozzles and reducing spray drift. 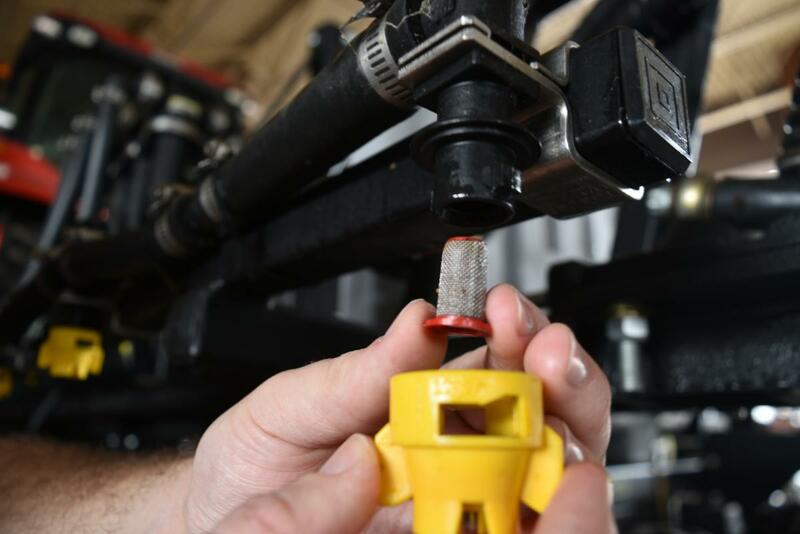 Show workers the differences between different spray nozzles. Have workers practice cleaning techniques. Nozzles regulate droplet size, spray flow, and spray pattern. The right spray nozzle is critical for safe spraying and effective application. The right nozzle causes less spray drift to unintended areas like other crops or backyards. Other safe techniques can also help reduce spray drift. Flow regulation affects the application rate. Nozzle opening size and spray pressure affect the flow rate through nozzles. These factors can be varied by selecting a different nozzle size or adjusting the pressure. Usually, increasing nozzle pressure decreases droplet size. Increasing tip spray angle can also decrease droplet size. 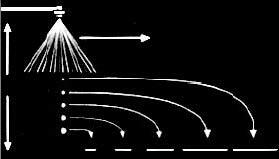 As shown in the figure, smaller droplets drift longer distances. Weather has a strong influence on spray drift. Wind direction and speed can cause spray to drift away from its target. The larger the droplet, the faster it falls toward its target, and the less likely it is to drift. However, high winds can cause large droplets to drift off target. There are three basic nozzle spray patterns. Each is best for certain applications. Flat-spray, or flat-fan, nozzles spray droplets from a flat-spray tip. They form a fan-shaped pattern as they leave the nozzle opening. A flat-spray nozzle is the only kind that puts out herbicide accurately and uniformly. The edges of the pattern have a lower spray volume. So, patterns of adjacent nozzles must overlap to obtain uniform coverage. Wider-angle nozzles produce smaller droplets. Narrow-angle spray tips produce a more penetrating spray. They are also less likely to become clogged. Hollow-cone nozzles produce a spray pattern with the liquid on the outside of a cone. These are best when penetration and coverage are critical. The typical spray distribution is saddle-shaped. There is less liquid in the center of the distribution, tapering off rapidly at the edges. It is not well-suited for broadcast applications; proper overlap is difficult. Generally produces the smallest droplets. Spray drift can be high because of the many small droplets produced at the normal operating pressure of 40 pounds per square inch (psi) and above. Wide-angle full-cone nozzles produce large droplets distributed throughout a full cone. These are good for soil-applied and systemic herbicides. Maximum drift control at pressures of 15 to 20 psi is achieved. The uniform spray pattern is maintained over a pressure range of 10 to 40 psi. Droplets are larger than with other tip styles of equal capacity at similar pressures. Use water that looks clean enough to drink when cleaning the sprayer. Foreign materials in the water can wear out nozzles. Watch the output pattern of nozzles periodically. Streaks in the pattern indicate foreign material inside the nozzles. Remove and clean nozzles. Use a soft brush for the tip and screen with strong detergent solution or kerosene. Use a wooden toothpick to unclog nozzle tips. A pin, a knife, or any other metal object can completely change the spray pattern capacity of the tip. Use nozzles that produce coarser droplets on targets that do not require small, uniformly distributed droplets. Use nozzles with larger orifices. Use nozzles with narrower spray-fan angles. Avoid spraying on extremely hot and dry days. Do not spray when wind speeds are higher than 5 mph. Avoid spraying near sensitive crops downwind. Leave a buffer strip of 50 to 100 feet, and spray the strip later when the wind shifts. Workers must wear proper Personal Protection Equipment (PPE) when working with any type of pesticide, herbicide, or spray. Consult the product label for equipment requirements, such as latex gloves. For more details, refer to the Tailgate Safety Training modules Reading Pesticide Labels and Personal Protection Equipment (PPE) for Pesticides. Nozzles regulate spray flow, droplet size, and spray pattern. Opening size and spray pressure affect flow rate through the nozzle. Droplet size varies due to pressure, climatic conditions, and nozzle size. There are three basic spray pattern shapes—flat-spray, hollow-cone, and full-cone.